The truth is that beef cattle spend the first six months of life with their mothers grazing in this natural way. They do have an idyllic life for their first six months. And then everything changes. 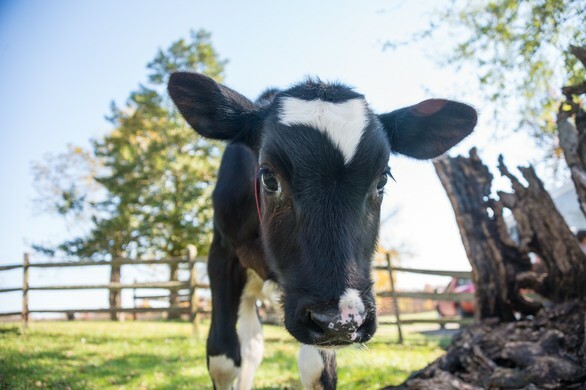 At this point, the calf will be forcibly weaned from his mother and moved into a pen, where he will begin to eat from a trough and be introduced to corn so that he can put on weight in an unnaturally fast period of time. Cows are ruminants, which means they have four compartment stomachs including the rumen. A ruminant digests plant-based food by initially softening it through bacterial compounds within the first compartment of the stomach, then regurgitating the semi-digested mass, known as cud, and chewing it again. This process of chewing the cud to break it down further and stimulate digestion is called "ruminating.” But the rumen is evolved to digest grass, not corn, which is highly starchy and too difficult to digest. Basically, because they can’t properly digest the corn, gas builds up and can’t escape. The rumen expands like a balloon, putting pressure on the internal organs, which will ultimately kill the animal if not treated. As soon as the cow is switched to corn, he develops these digestive problems. He gets bloat, and stops ruminating. Corn-fed cows are also susceptible to acidosis of the rumen, which eventually leads to ulceration of the rumen. Bacteria escape from the rumen into the blood stream, and end up in the liver, creating liver abscesses. According to New York Times food writer Michael Pollan, 15 to 30 percent of all cow livers are too abscessed for people to eat, but overall it is still more profitable to fatten the cows up on the corn, so the diseased liver is seen as acceptable collateral damage. Not too long ago, cows were slaughtered at the age of about four or five, but it’s a lot more profitable to fatten them up faster and kill them sooner. This accelerated weight gain is only accomplished by a diet of corn, protein, and fat supplements. But feeding them this diet will kill them before they ever get to market unless they are treated prophylactically with antibiotics, which explains why 95% of the antibiotics used worldwide are given to farmed animals who are not sick but who would likely die from illness and disease if they were not given antibiotics. By the age of about eight months, all beef cows are sent to the feedlot, where they continue feeding on corn and are crowded by the thousands into long dusty open air pens with no protection from the elements. They stand ankle deep in their own manure, inhaling toxic bacteria-filled air. They will live here until the age of about 14 months, at which point they will be trucked to slaughter. Grass-fed beef has its own problems and is arguably even more environmentally destructive, as more land and other resources are required to raise the animals. Most of the destruction of the rainforest can be attributed to grass-fed beef production.